The smallest Mahindra SUV will be getting an upgrade. The new Mahindra KUV100 2017 shall receive some upgrades to make it more competitive. As the Maruti Ignis shall be launched, the KUV100 will loose out on sales as it has lesser features. Mahindra has worked out an upgrade for their super compact SUV for this reason. The new Mahindra KUV100 2017 shall get some additional features. What are they read further to know more. In terms of pricing, The Mahindra KUV100 sits close to the Hyundai Grand i10. This way it looks like an SUV and is priced like a hatchback. Both petrol and diesel engines are available with this SUV. There will be no change in the pricing. Until then read our review of the Mahindra KUV100. As there aren’t many changes except the addition of features, this will continue to be the review for the New Mahindra KUV100 2017. The Mahindra KUV100 gets an all new styling, something never seen before. It has a sleek front grille with slim, elongated headlamps. LEDs are integrated in the headlamps. The fog lamps are rectangular in shape to give it a beefy look. 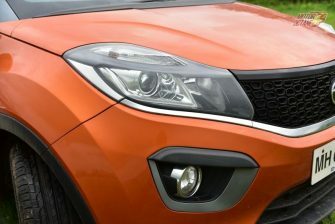 The KUV100 has stylish front end and the design continues to the side as well. There are thick lines running across the side profile. The door handle for the rear door is located next to the window. The sporty rear end makes it quite appealing as well. The Mahindra KUV100 has wrap around tail lamps and the shallow glass area at the rear makes it look trendy. The Mahindra KUV100 has all new interiors. Yes, it is stylish and something we don’t see often. Nothing is shared with any other Mahindra vehicle. There is a five seater version and even has a six seater version. The six seater is a 3+3 seating. The dashboard is grey and it looks stylish. 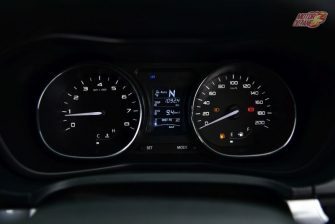 The twin dial instrument cluster has red dials. 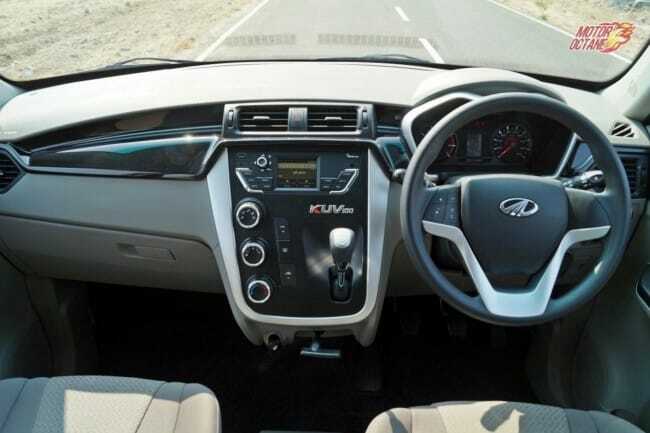 The steering wheel 0n the Mahindra KUV100 is all new. This is a small size wheel that is easy to use. 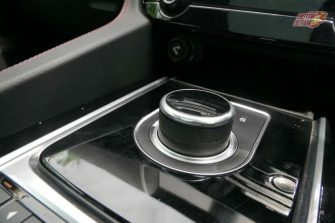 The gear stick is mounted on the centre console and is very easy to use. In terms of quality, the finish is a bit raw and doesn’t feel premium. However, it has a pleasing feel. The front row seats have good enough space. In the 3+3 seater, the middle seat also doubles as a centre armrest. The second row doesn’t get an arm rest. The boot is quite small and its difficult to pack in a reasonable amount of luggage. The Mahindra KUV100 is best suited for the city. The Mahindra KUV100 comes with some features such as steering mounted audio controls, all four power windows, power steering and even dual airbags and ABS. The base variant of the Mahindra KUV100 comes with drive airbag and ABS as a standard feature. There is sufficient space in the seat pockets to keep documents.The rear door pocket can hold one litre of of bottle each as well. 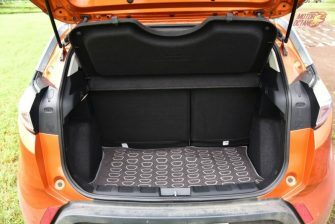 The KUV100’s 243 litres of boot space is adequate and there are also tumble down folding rear seats that increases the boot space even further. 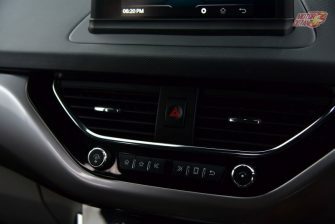 The features on the Mahindra KUV100 are several like an in-dash music system with six speakers, bluetooth connectivity, ABS comes as standard, dual airbags is optional on all variants, puddle lamps on all doors, interior ambient lighting, gear shift indicator, multiple storage spaces like under floor storage for rear passengers, cup holders in the arm rest etc. 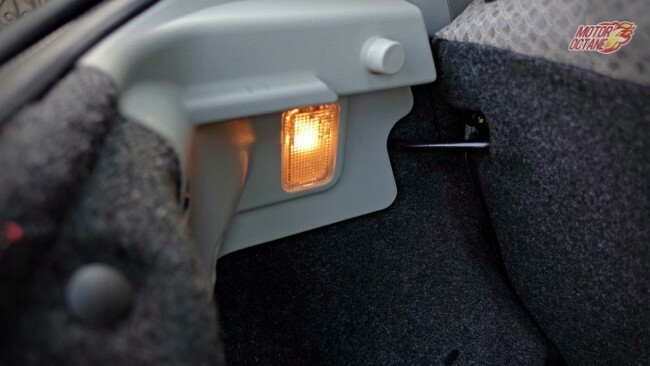 There are also features like follow-me headlamps, automatic hazard lights on panic braking, ISOFIX child seats and flat flow in first and second rows. 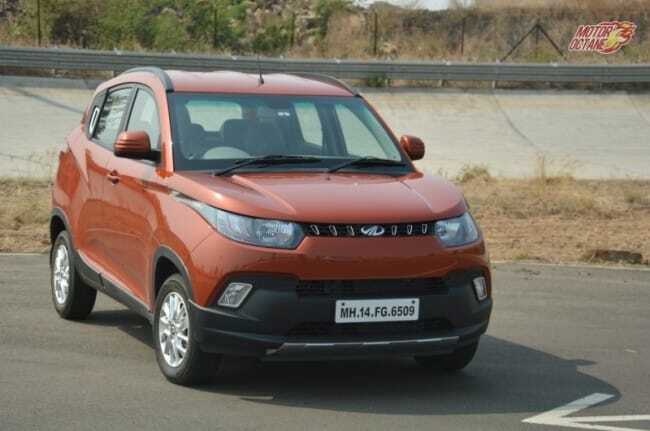 Despite a 1.2-litre engine, the Mahindra KUV100 petrol and diesel are not short on performance. This vehicle has been designed for Indian roads and certainly does the job well. There is more than sufficient power on this SUV to drive in the city or even on the highway. If you want to improve your mileage, then get into the Eco mode. There is a reduction in performance, but a major bump in the mileage. 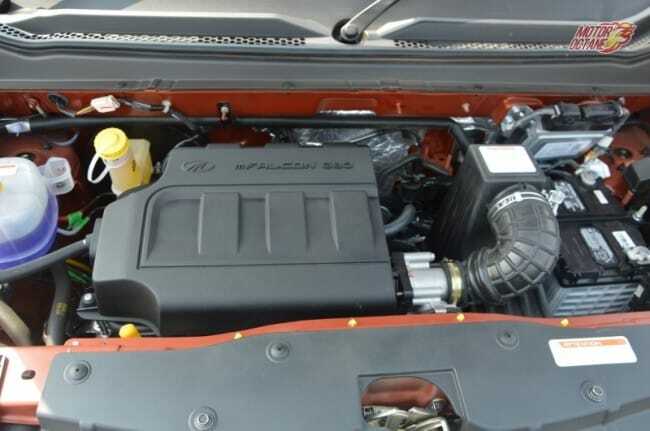 The petrol engine of the Mahindra KUV100 has a lot of vibrations, when you are at idle (not moving with engine on). The engine performance vis-a-vis size of the engine and the vehicle is very good. There is a frequent need to shift gears. The Mahindra KUV100 even gets the micro-hybrid, the start-stop technology and the diesel variant even has something like a multi-drive mode. There is a power mode and an Eco mode as well. The gear lever is mounted on the dashboard, and the shifts are short. The Mahindra KUV100 gear lever doesn’t feel rubbery at all. Driving in city is a breeze, however the clutch position is a bit odd. The clutch is heavy too on the diesel, which makes driving in city traffic a bit cumbersome. The Mahindra KUV100 has good ride on smooth roads. Even at high speeds, the ride doesn’t feel unsettled. However on bumpy roads, the KUV100 feels a bit jittery. There is a feeling of disconnect when going on a bump. The handling too is decent of the Mahindra KUV100. There isn’t a lot of body roll, unless you chuck the steering wheel aggressively. When you drive around bends, the steering wheel doesn’t feel lively and this is discouraging. The other downside of the steering feel. At low speeds it is heavy, which means more efforts to park and it is extremely light at high speeds. Again losing confidence. The Mahindra KUV100 is made available in seven fresh colours like Pearl White, Aquamarine, Dazzling Silver, Flamboyant Red, Fiery Orange, Designer Grey and Midnight Black. The KUV100 will compete with the Maruti Ignis and the Tata Tiago Aktiv. Both these competition products haven’t been launched yet. These will take a while to come in. Maruti Ignis will come by early 2017. The new Mahindra KUV100 is the most fuel efficient diesel SUV in the country with a fuel efficiency of 25.32 km/l. The petrol has a fuel efficiency of 18.15km/l. These are ARAI figures. In the real world, the KUV100 diesel has returned us an efficiency of about 13km/l in the city, while on the highway it is about 18km/l. 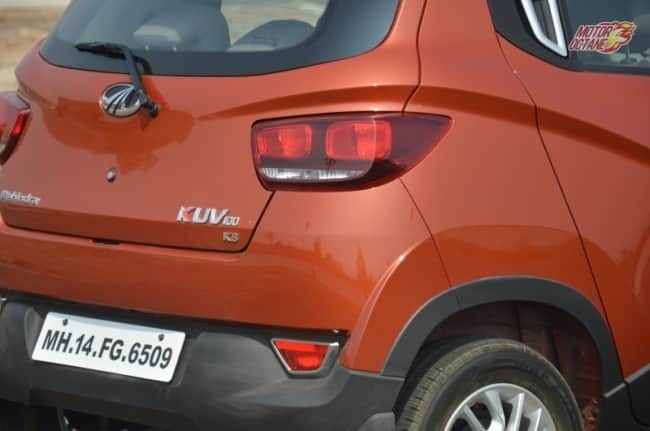 The KUV100 returned about 11km/l in the city, while on the highway it is about 15km/l. The Mahindra KUV100 diesel has a top speed of about 158km/hr, while the petrol version has a top speed of about 134km/hr. The diesel has a higher top speed. One of the first premium SUVs in the country – the Honda CR-V has come a long way since first launched. The CR-V has created an imagery that is premium and upmarket. 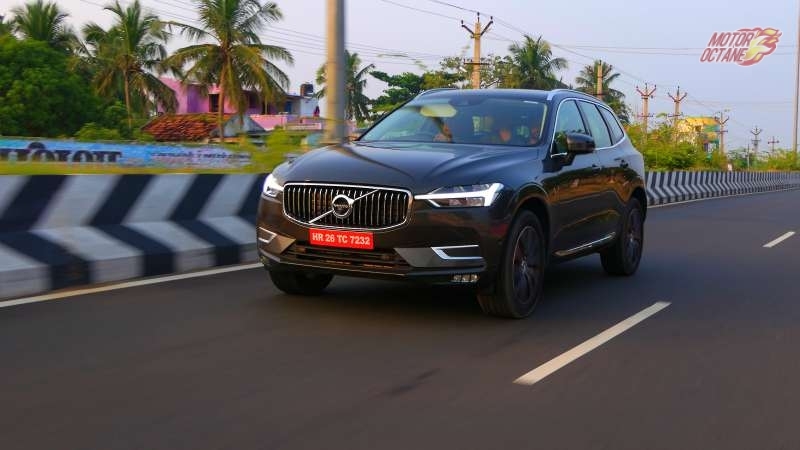 However, a lack of a diesel engine and added flexibility was an area of concern and hence the SUV sold in very limited numbers. 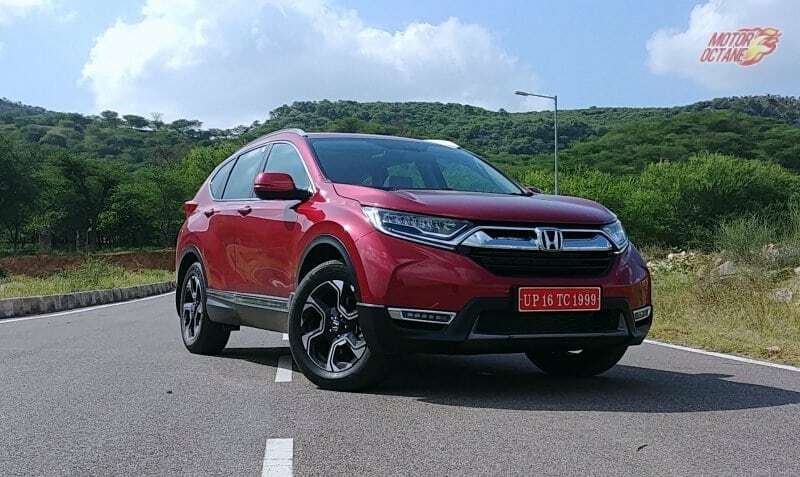 Now, Honda has given it a shot in its arm with the new generation 2018 Honda CR-V, which promises a lot and also now comes with a diesel engine, apart from having a seven seat option. 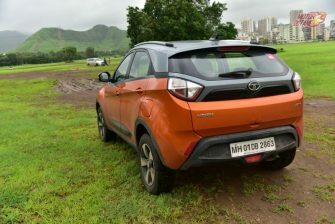 Let me come out straight and say it, ever since the Tata Nexon came out, I loved it. The compact SUV hit the sweet spot of being butch and suave at the same time. 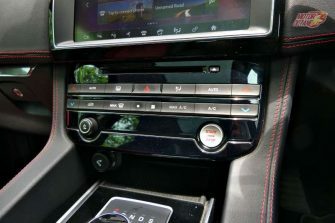 Inside it was nothing like a Tata of the past, as one friend looked at the floating infotainment touchscreen and pointed out that it looked like his Mercedes CLA’s unit. But overall I have always loved the price. Tata got that pretty bang on. It could appeal to someone who likes the design and also to someone who is buying the car with the ‘budget thinking cap’ on. And now Tata has sweetened the deal for many city slickers like us. Don’t want a six-speed manual diesel engine? Here’s something for you. We have finally got our hands on the petrol AMT variant to find out more. Now what do we have here? We have the Tata Nexon XZA petrol variant. 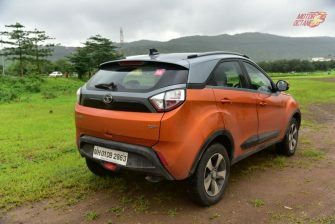 The first thing you notice is with this variant, Tata has done away with the white color strip that ran across the doors, the rear and the also encompass the fog lamp housing in the front. They have been replaced with the color gray. This I must say is an improvement with the white really shouting and dividing the cars parts into different portions earlier. Now it all comes together more effortlessly. And with the Etna Orange color and the Sonic Silver dual tone option, the grey acts like a bridge between these two color transitions. This is the first time the paintjob of the car looks like it’s been given the same amount of attention as the rest of the design. The projector headlights with the day-time running lamps look brilliant. The black grill could be easily done in grey or chrome too, but it looks restrained and very classy in black. The large rear view mirrors with their integrated turn signals look great and have from the drivers view provide excellent visibility. Below all of that are the tyres. 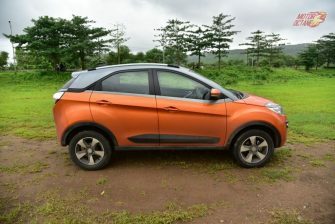 The 16-inch chunky alloys look great and proportionate to the size of the car and add to the superb 209mm ground clearance. Now I’m one of those guys who still like his SUVs a bit boxy. But with the Nexon and all its aspects and design cues coming together, the car leaves an impression on you. Like the rear tail lamps are a favorite. I and Rachit (hosts our YouTube channel) have often discussed how they look like the eyes of a devil or some dangerous animal at night. In the end let me just say, while driving back at night in the Nexon after testing, I was waiting at a red light and a traffic constable gave me a thumbs up. Afterwards, when I rolled the window down to talk to him, he told me it’s one of the brightest and best looking cars he has seen all day. 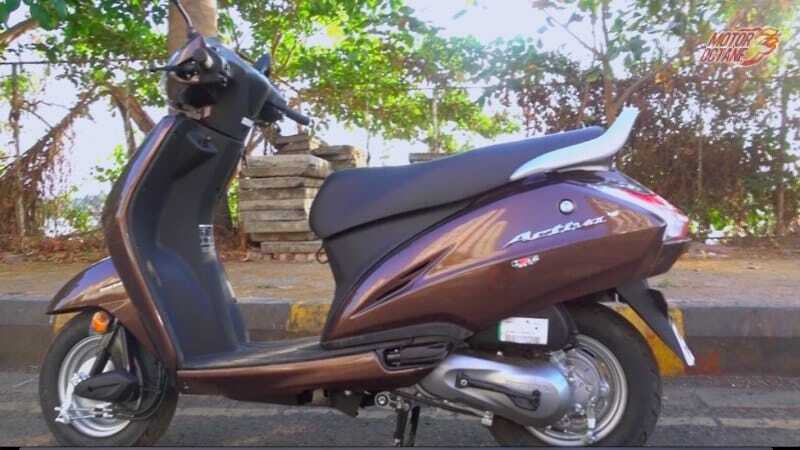 He guessed the price to be around 20 to 25 lakhs. When I told him the real price and the equipment on-board, he said ‘he would love to own such a car’. This goes on to show how the car has caught on and people like the Nexon’s big and sculpted design. Now let’s get into the interior. Once you have pressed the rubber button on the door handle and swung the door open, you climb into the Nexon which has keyless entry (I wish all modern cars should have this feature as standard). Inside, the ambiance of the exterior is carried on. This is my favorite part of the Nexon. It’s plush and well built. Nothing rattles. The floating touch screen is a beautiful. The fabric seats are good enough and offer good shoulder and thigh support. On the inside, the car comes with tablet-touchscreen display by Harmann with steering mounted audio controls, climate control, electrically folding wing mirrors, height adjustable driver seat and folding rear seats as well. It gets twin-airbags in the front and ABS with EBD as a part of the safety pack. The interior is one of the safest in the country too. The Nexon recently got a 4 star Euro-NCAP rating. 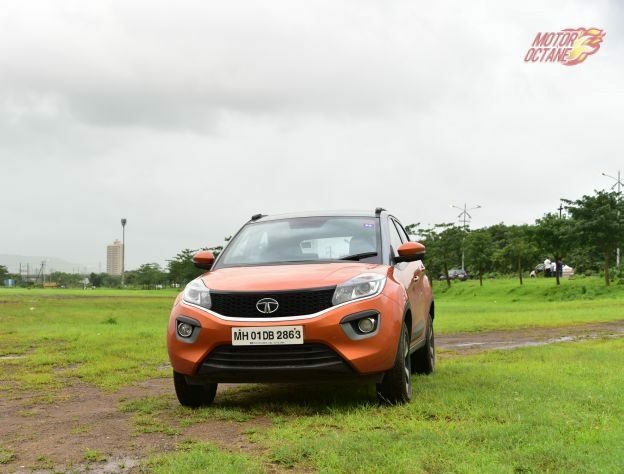 This really makes the Tata Nexon a perfect buy for the city. The Nexon AMT variant gets the same Multi-Drive modes (Eco, City and Sport) from the manual variant and also a creep function, which is a boon in bumper-to-bumper traffic. The three-cylinder turbo-petrol engine develops the same 110hp and 170Nm of torque. Engage the Eco mode and you will see the shifts happening earlier and the transition between gears becoming much smoother as compared to the City mode. The Sport mode is definitely the one which most drivers will prefer as the gearbox holds on to a gear much longer than in other modes. Move the gear lever to the left, to manual mode, and you can take control of the shifts. This doesn’t make gear shifting any quicker. On the other hand, it delays in upshifts as well as downshifts when in manual mode and I found it best to leave it in Sports, which is the best mode to be in. 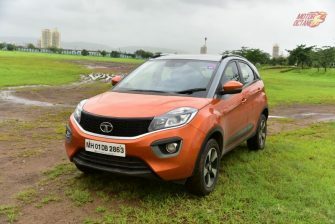 Overall I would say the diesel is way better in the manual and AMT variants and I personally love the six-speed manual offered on the Nexon. When you drive the petrol AMT you will find yourself switching between Eco, City and Sport modes constantly, to find the sweet spot. I think the best mode is City for daily use, with Sport left for spirited drives on the highway and Eco for when you’re low on fuel and need the car changing into higher gears fast. And to be honest apart from my love for the diesel Nexon variants, this car is aimed at you city-dwellers. This car is quiet at 60 and even at 80 with the radio on; you don’t need to raise your voice to talk to fellow passengers. 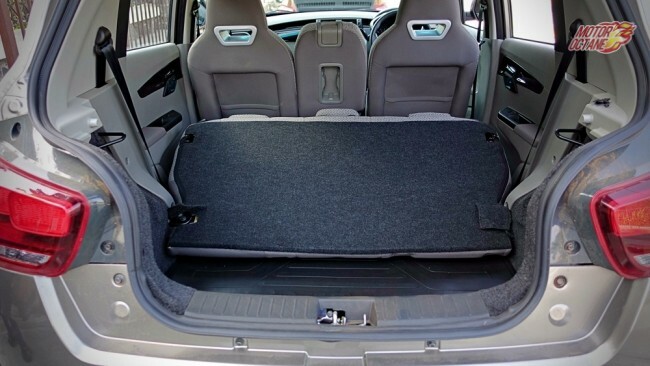 It’s easy to manure in traffic with the SUV body making its presence felt and you as a driver will not find it any more difficult than a small hatchback. The petrol Nexon is cheaper to buy than the diesel with the prices starting at 8.70 lakhs (On-road Mumbai) for the XMA variant and going up to 11.23 lakhs for the top end XZA Dual Tone option. This makes it cheaper than many compact sedans and boasts a spec sheet of a premium sedan. 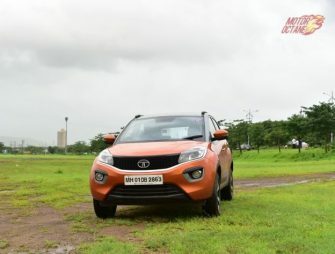 If you want a feature loaded big car with a automatic gearbox and a petrol engine and a very high safety rating, you have no better option than the Nexon Petrol AMT. An absolutely brilliant all-rounder which ticks all the right spots. The Renault Kwid 2018 has been launched today. 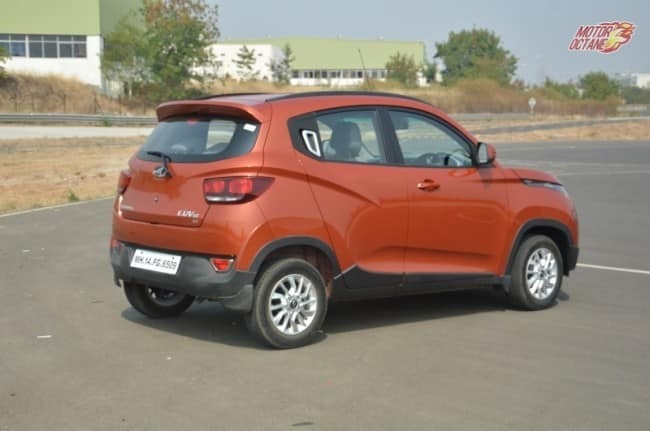 The car gets a lot of features and is hence called the Kwid Feature Loaded Range. Available in 8 trims with segment-first features, the new Renault KWID 2018 Feature Loaded Range has been launched at no additional price, further enhancing its value proposition. 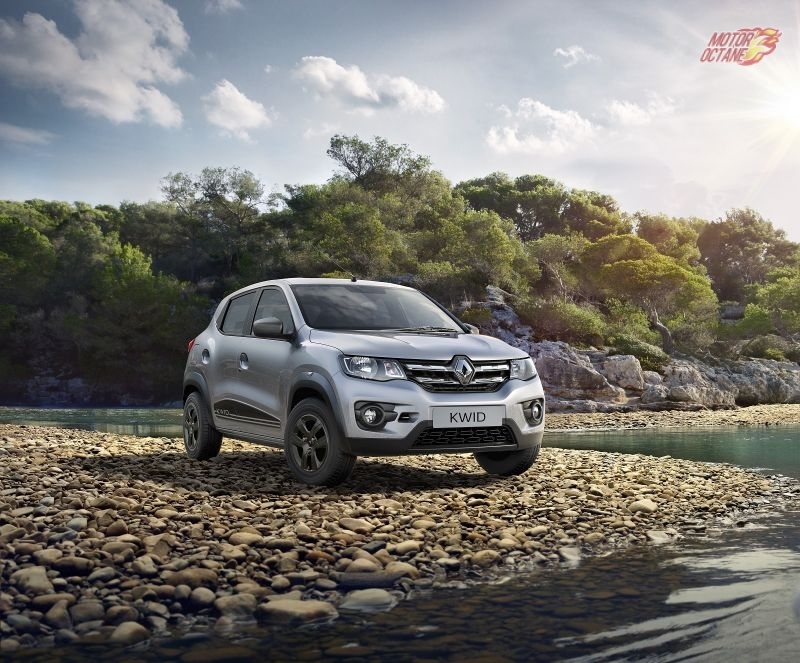 The Renault Kwid has been a redefining product in its category. The Renault Kwid 2018 is one of the few cars to take on the mighty Maruti Alto 800 and provide some stiff competition to it. The Kwid is not compromised in terms of features as much as others in the segment. Do read further to know more about the Renault Kwid 2018 Feature Loaded variant. The Hero Xtreme 200R was unveiled a few months back. 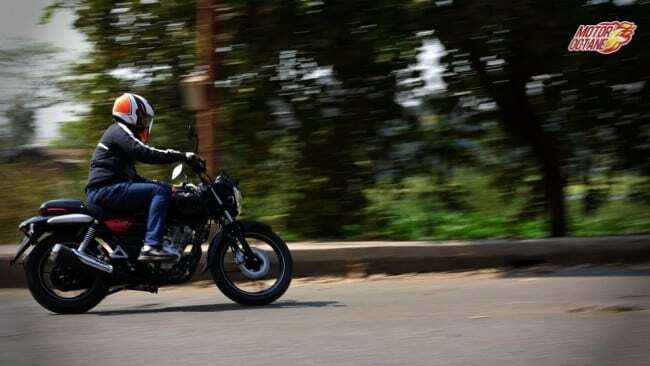 This is the latest sporty enthusiast’s bike form Hero. The Xtreme is now more powerful and gets a few upgrades apart from the new engine. 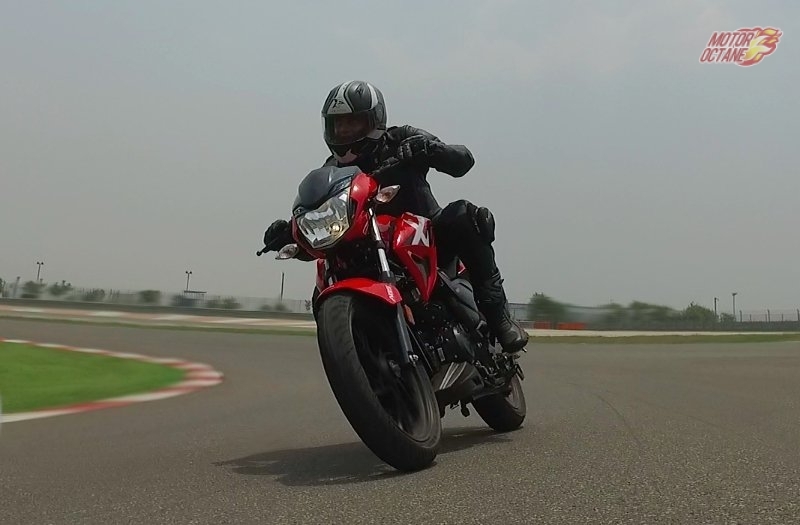 We ride this new offering from Hero on the Buddh International Circuit and find out how it is. What we can say is that it is not the same Xtreme as earlier, but a more improved motorcycle, in most departments. Want to know more this bike? Read further for our review. 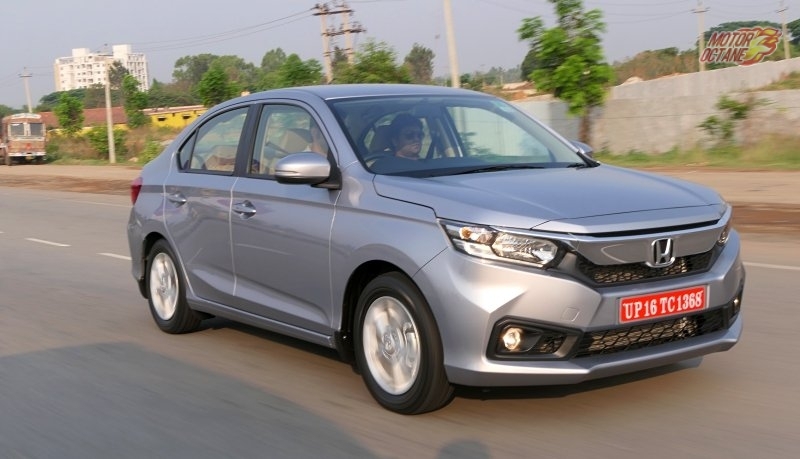 Honda has introduced the All-New Amaze. This new car is in its second generation. It is completely different from its outgoing model. It is now richer in features, exterior design, interiors and also in variant options. We drive the 2018 Honda Amaze in Bengaluru, to find out how this new generation model is. To know more about it, keep reading further. 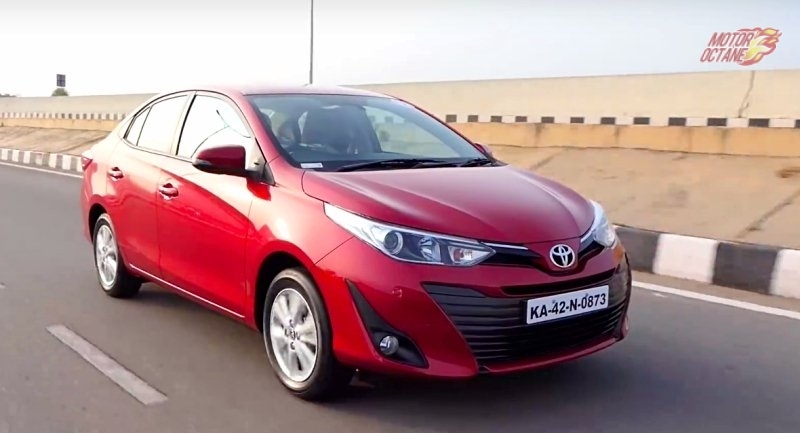 Yaris is Toyota’s first serious attempt at penetrating into the mid-size car market in India, dominated by the two strong players Honda City & Hyundai Verna, over the years. Is this new entrant, armed with a host of segment first features strong enough to alter the segment positions? 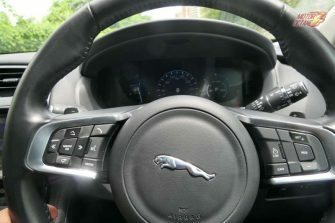 While we would come up with a detailed road test and a comparison story a little later, let’s look at the some first impressions from the test drive we had. 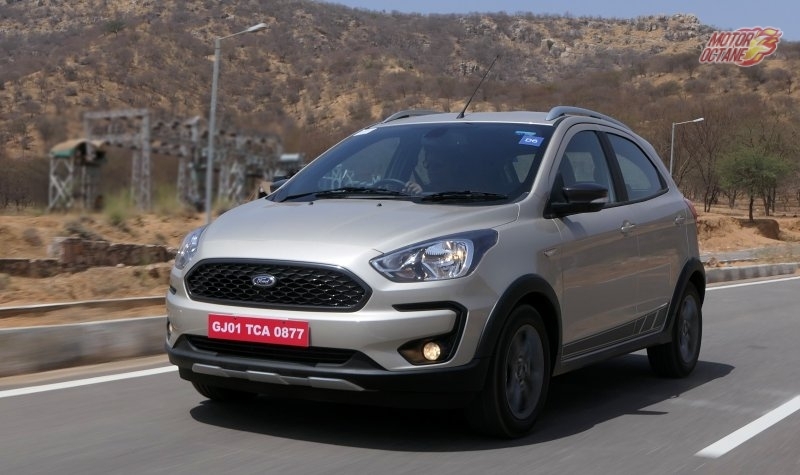 Ford has introduced its latest crossover for the Indian market. This is the Ford Freestyle. It is based on the Figo hatchback, but gets spruced up quite a bit. How good is it? Should you buy it or avoid it? We tell you this in our detailed review. Keep reading further. The Honda WRV has been one of the best sellers from the Japanese manufacturer. The crossover has sold more than 50,000 units, thereby becoming one of the most important products for the company. Honda WRV clocked 37,031 units last financial year and the company says that the crossover accounts for 28% of its sales. Honda WRV was conceived in India and is the first Honda product to have extensive R&D work carried out in India. This is therefore an important milestone for the company. As per Honda, 80% of the sales come for the top-of the line VX variant and only 20% were in the entry-level S variant. We have in past also pointed out that surprisingly, one of the key factors for high sales of WRV in its category has been the offering of a sunroof. The Honda Jazz was not as big a hit as the WRV. Clearly the WRV has bettered its competition on many counts. 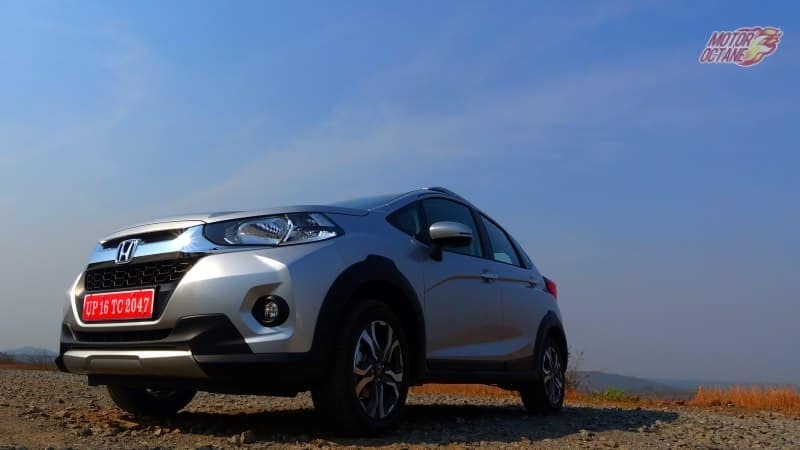 Honda WRV is one of the best sellers in its segment which comprises of the Ford Ecosport, Maruti Vitara Brezza and the Tata Nexon. 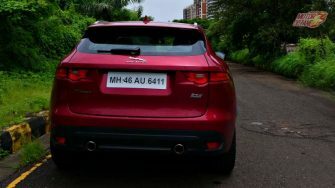 This is a compact SUV that is based on the Jazz and has a lot of similarity to the hatchback. The exterior might not say that, and it looks like a totally different vehicle. The interiors are where there is a lot of similarity. This SUV is under 4 metres too. There are more features on offer too. 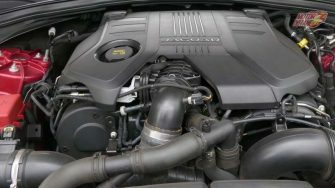 The engines available are the 1.2-litre petrol with a five-speed manual and a 1.5-litre diesel with a six-speed manual. The Honda WRV offers a lot more features. In terms of space it is the same like the Jazz. There is no differentiating factor there. Should you consider buying this new compact SUV? Or look at something else? A good option for those who need a higher premium hatchback with good ground clearance, the Honda WRV will make more a better buy. 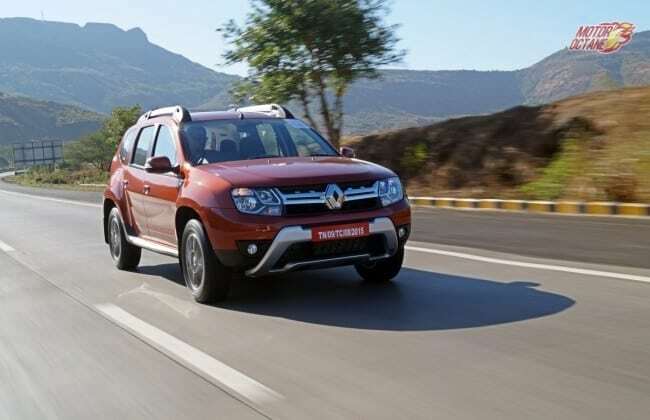 The price of the Renault Duster has been dropped. The SUV had come under a lot of pressure lately, after the success of the Hyundai Creta. 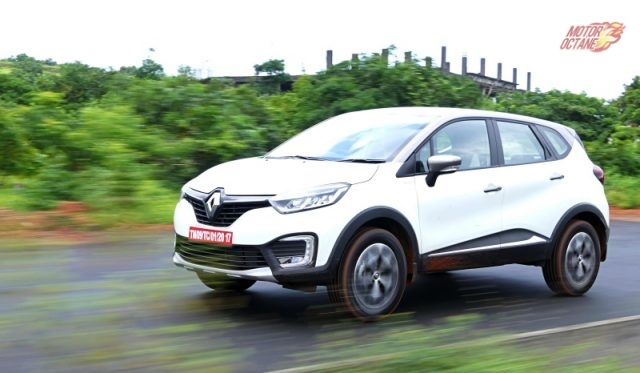 The launch of the Renault Captur had got buyers confused, as the price of the Duster and Captur was not very different. Owing to low volumes, Renault has decided to reposition the Duster, which has been their best seller before the arrival of Kwid. The Renault Duster petrol now starts ₹ 7.95 lakhs (ex-showroom, Delhi) and the diesel version starts from ₹ 8.95 lakhs. The Petrol CVT variant is now priced at ₹ 9.95 lakhs. These are ex-showroom, Delhi prices. 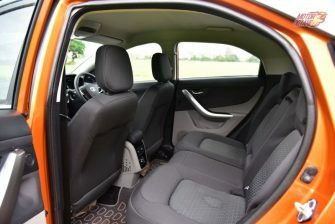 The repositioning of the Duster comes as a good news for several customers and Duster fans. Luxury cars aren’t just about being luxurious, but even style, premium-ness and exclusive. The niche-ness does exist. Buyers have been looking at the three Germans and the British marquee JLR off lately. There has been one brand that has been steadily growing and is happy to be niche at the moment. Its the Scandinavian brand Volvo. A company that went through its hardship of financial crisis at the global level. Then it revived itself with the XC90, then the S90 and the V90. Now it is the XC60. The new-generation that has evolved, and gets a new platform. The previous XC60 contributed to about 30% of their sales. Now, it is new-generation that will boost the numbers. 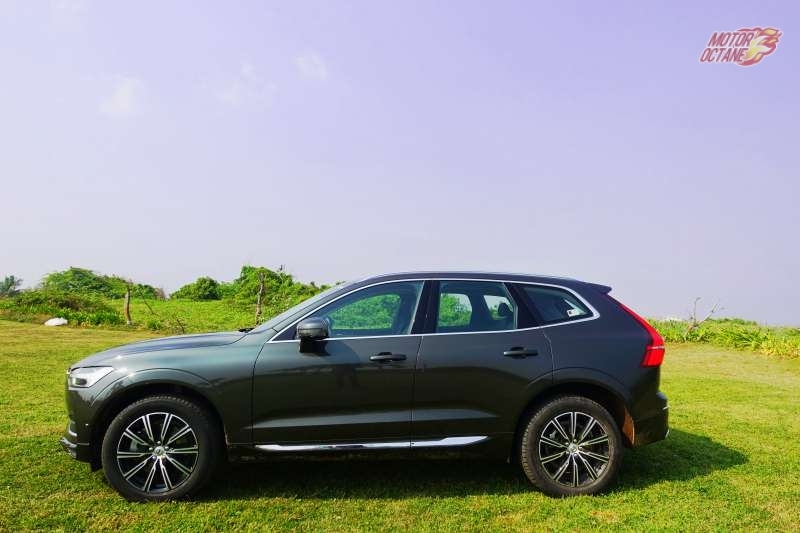 The Volvo XC90 is a masterpiece and so is the S90. I can drool over the design every time I see it. The same thing has been done on the XC60 too. The signature front grille is carried on the new SUV. It looks good, but one can again relate it to the bigger brother. I love the Thor hammer-design headlamps, but something different might just have been perfect. The XC60 is good but it does reflect a lot of its design from its elder brother. The side profile is very much crossover like. The front end has a streamlined design, moving to the rear that becomes squarish for better practicality. The 19-inch alloy wheels are just Wow! But for long road trips, I will be a bit worried to drive as the tyre profile is low. The tail lamps are stylish and I love them too. This is one aspect, which cannot be done to a crossover/SUV for the Indian car market. I have no complains about how good this crossover looks, but my point is why not have something expectational and exclusive. Yes, they look classy and stylish. But creativity in design has taken a back seat in the luxury car segment. In attempt to have more family look, the design is becoming similar on all the products. This is true with all the brands. Still the Volvo does stand out of the rest. Step into the Volvo and you could believe this is something from the space age. Even the Tesla has a similar styling pattern though. There is a large touchscreen system with all the controls for music and even air-cons. The touch and response of the system is as good as an iPad. The music system output is through 15-speakers of Bower and Wilkins. The music quality of these speakers is fantastic. Minimal buttons to operate makes things easy. This feels like a cockpit of an airport that has got all touch controls. All the dials have the texture that appears to be chiselled. You do not press the start stop button, you rotate it. The interiors do make you feel special every time you step inside. 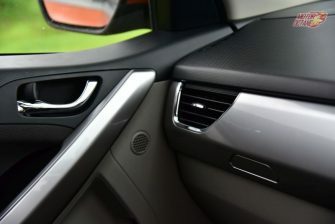 The Volvo XC60’s exterior styling and interiors do make you like it every time you step into it. The wood inserts on the dash and the ceramic finish on the sliding tambour made me fall in love with it. The cabin felt it was designed by someone from Armani. Everything had a character and essence to it. This was joyful and pleasing too. The interiors are stylish and appealing. The ambience is soothing and so comfortable. In the cabin the seats offer good support. For your back, for your lumbar, thighs and even side. This is a comfortable vehicle, and there is ventilated seats for the front and rear gets only heated seats. 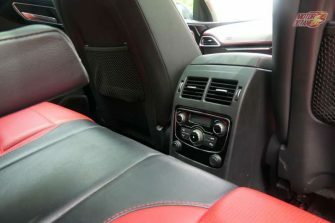 Rear passengers have AC vents, there is also a touchscreen for controlling AC blower speed and rear seat heating too. 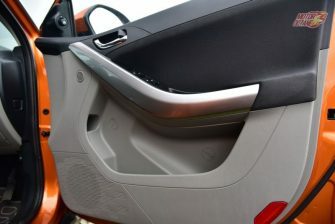 The rear seats are lower than the front, which will reduce the side movement on winding roads. The boot can also easily gobble luggage for an entire weekend. There is also the panoramic sunroof, which is a good addition. A 2.0-litre diesel engine that churns about 235bhp of power, a lot more than the other German diesels, and it comes mated to an eight-speed AISIN transmission. This is a self-shifting gearbox and it seems that Volvo hasn’t just offered the best-in-class power but even something close to the V6 offered by competition. The engine is absolutely silent and buyers will not realise its a diesel engine underneath. Twist the start button and the oil burner cranks to life without too much melodrama. The engine is responsive from the word go and it does make it easy to manoeuvre in the city. Overtaking is a breeze and this is a cruiser. It doesn’t make you want to push. There is no spool from the turbo making it a relaxed drive. The turbocharger kick-in is very linear. Change the mode by rolling to a different mode. This has the most powerful 2.0-litre diesel engine on offer at the moment in this segment. 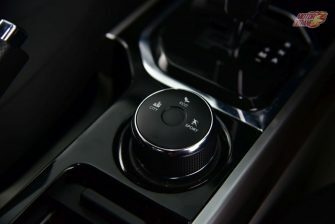 Before we get to the driving dynamics, there is more to the safety and riving assistance offered on the XC60. This is important as none of the competing products offer this and the XC60 has a long list of them. IntelliSafe technologies help protect not only the people inside the car but also consider people on the outside, for example technology that helps you to detect pedestrians and cyclists. When you drive at speeds up to 50 km/h, our City Safety collision avoidance technology looks ahead of you and brakes automatically if you are about to run into a vehicle in front. Our IntelliSafe technologies like Electronic Stability Control add to reassuring driving stability in all conditions without sacrificing the joy of driving. The new XC60 gets Steer Assist, which has been added to the ground-breaking City Safety system. 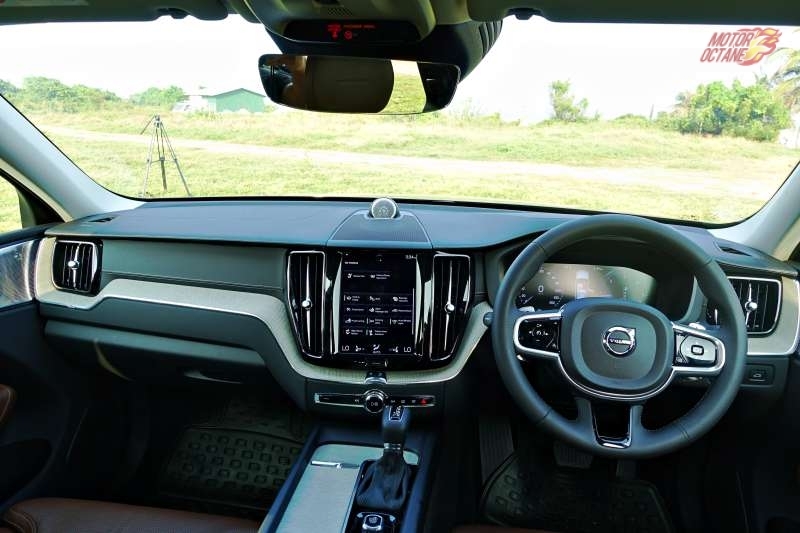 A new safety system called Oncoming Lane Mitigation uses steer assist to help mitigate head-on collisions, while Volvo’s Blind Spot Indication System (BLIS) now uses Steer Assist functionality to reduce the risk of lane-changing collisions. These system enabled by radar helps the driver arrive refreshed. In terms of ride quality, it has a supple ride. Ride on bad roads and you won’t feel much of the broken roads. The suspension glides on bad roads and irons out the undulations. 19-inch wheels, well we had a tyre cut on our test drive. These low profiles can be an issue in our Indian road conditions. The previous XC60 had loads of body roll, this has been taken care in the new one. The crossover is dynamic just like a sedan. 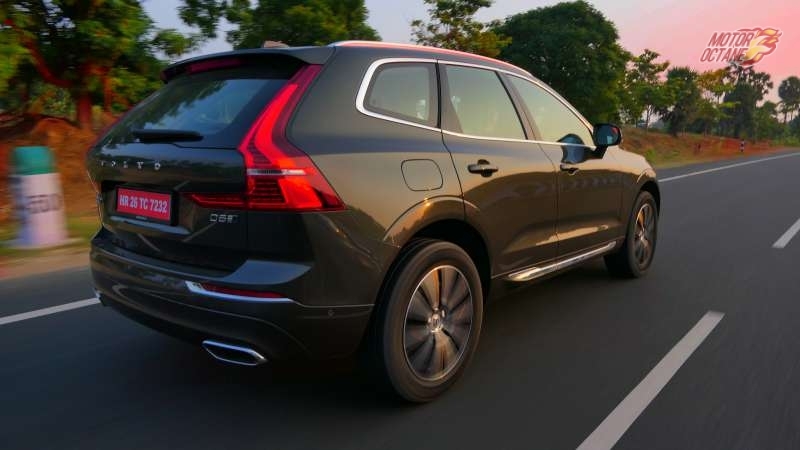 Volvo XC60 – Should you buy? 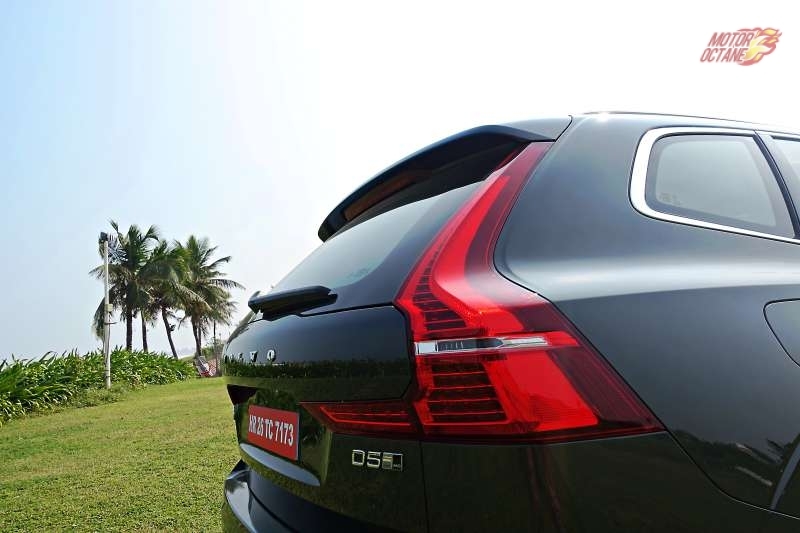 Moving on to the pricing, at Rs 55.90 lakhs (ex-showroom) Volvo has awestruck crossover buyers. It has been priced aggressively, despite of it being a complete body unit (CBU) import. The pricing is highly competitive and the features are the best in class. Wondering why you need any other SUV in this price point unless it is a 4×4. What goes missing on this SUV is the service network and the brand name that the three German enjoy. 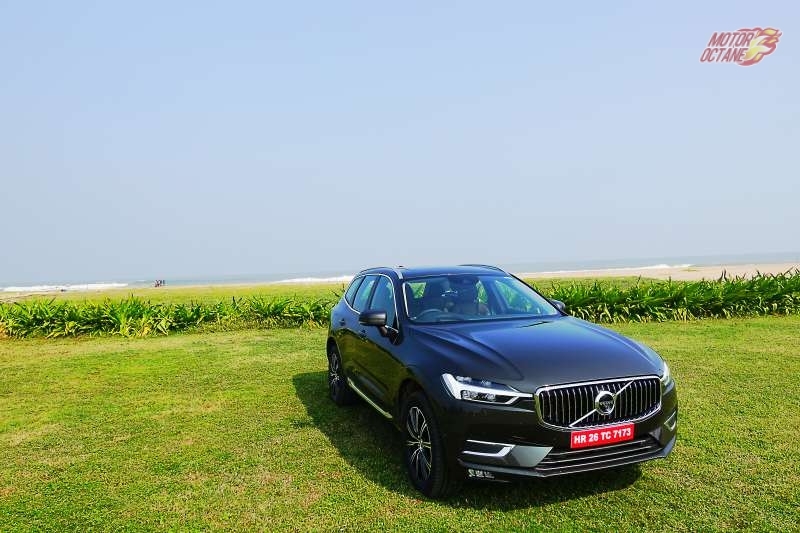 Else, the Volvo is a best offering in this segment at the moment. They had done this with the XC90 with the first-gen and the new XC60 promises to fulfil in this segment too. What happens when you demand a little too much from your everyday car. When you want an ultra-luxurious cabin endorsed with latest feature gadgetry and a powertrain configuration capable of embracing any challenge thrown at you by an unforgiving terrain that comes your way. Is there an ultimate car that exists at both ends of consumer demand spectrum? 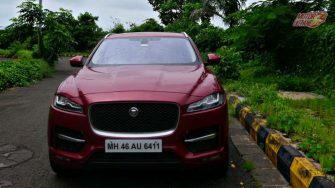 Read on to know more on one such machine we recently got to lay our hands on..
F-Pace is Jaguar’s first attempt at coming up with a luxury crossover performance SUV to compete with the already established models from the Audi, BMW & Mercedes stable. 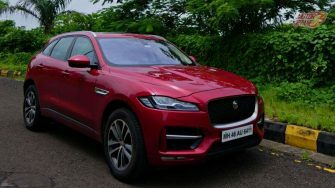 Launched in the year 2016, it is built on the same platform as used in some of the other popular sedan offerings from Jaguar like the XE & XF however in essence F-Pace derives a portion of its DNA from the Land Rover family, part of the same group. 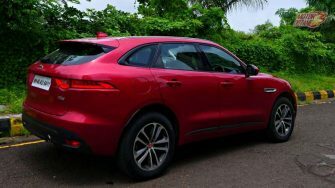 The F-Pace bears a clear design resemblance with its other Jaguar siblings, albeit every other car in the Jaguar line-up is a saloon but for this one exception. The stooping bonnet in the front with a large grille holding a jaguar face and its signature J blade DRLs leaves you in no doubt about its lineage. Large 20 inch alloy wheels plonked in wide shouldered wheel arches gives the car its macho looks. The slanted rear wind screen with a sporty spoiler and tail lamps inspired from the F-Type gives a strong sporty character to the car. The well-appointed interiors of the F-Pace have a lot in common with other Jaguars. You will find the familiar Rotary Gear Selector that rises up on cranking the engine. The plush leather seats with 10 way adjustable electric front seats are comfortable and give a sense of luxury at the same time. One can also set up a mood lighting option picking up shades based on personal choice. The relatively longer wheelbase and decently wide cabin makes it a nice place to be in. 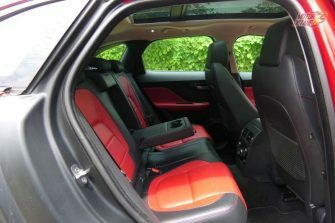 Rear seats are wide with adequate room for three adult passengers sitting side by side. A 40:20:40 rear seat split option provides flexibility for carrying a range of personal belongings otherwise difficult to carry in a car due to an odd size or shape. A sliding panoramic sunroof with electric blinds adds to the feeling of space inside. F-Pace comes equipped with a range of advanced and innovative features. 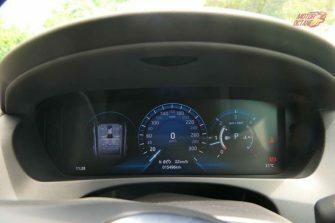 The high end R-Sport version that we drove had a 10.2 inch touch screen in the central console in addition to a 12.3 inch digital instrument panel with virtual dials and a full screen map view option. 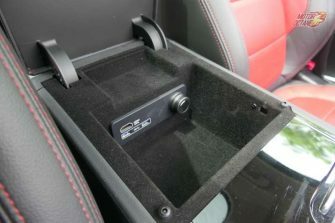 For the more demanding customers, F-Pace gives you an 825W Meridian sound system with 17 speakers and is equipped with a customisable Head-Up Display which keeps the driver notified on vehicle speed, navigation signals & cruise control status. 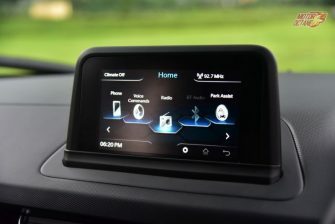 Plus, it has a park assist feature supported with a 360 degree surround camera system and an activity key in the form of a sturdy, stylish waterproof wrist band that can help one access the car without the use of primary key. 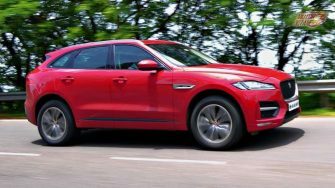 Jaguar F-Pace S is the more powerful 3.0L V6 Diesel with 300PS power and 700Nm of torque. The light-weight aluminium body construction ensures that the car doesn’t behave its true weight or reminds you of its dimensions when it comes to a swift driving manoeuvre on road. 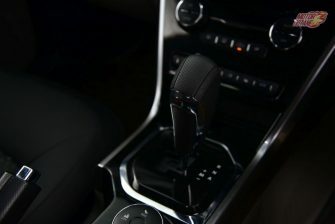 The eight speed automatic transmission is a breeze to drive and has an option of changing gears manually using the steering mounted pedal shifts. A zero to hundred is achieved in an impressive 6.2sec. Please the throttle and you will be talking to the wind. There is more than sufficient pull in their engine to challenge other luxury sedans. The pull is linear and there isn’t the turbo kick that will make you go bonkers. 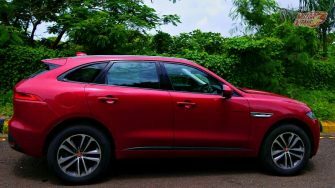 Jaguar F-Pace has received various honours and acclaims across the globe. 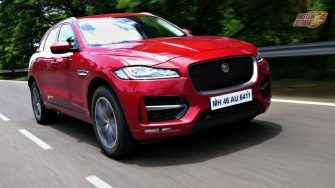 It indeed is a well deserving car and with a price band of Rs 79L to 1.41Cr it sure is capable of bringing about a new wave of change in the Indian market. 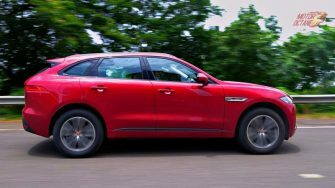 In our opinion, F-Pace is the car that can carry you in style for a late evening Russian Ballet performance at a prestigious venue like Bolshoi and also lets you climb atop treacherous mountain peaks in the Alps with ease. So, if you wish to stand out of the crowd and are looking for a new option that’s bold, stylish, powerful and yet practical all at the same time, then F-Pace is the right choice for you. The facelift version of the XUV500 is expected around next year. The Indian UV maker is looking at introducing this to enhance its numbers. New products like the Tata Hexa, Toyota Innova Crysta and Jeep Compass have negatively affected the sales of the Mahindra flagship SUV. 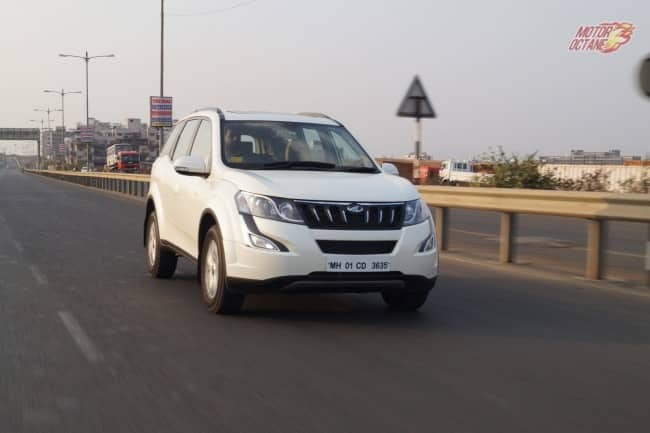 Mahindra has taken note of this and before the facelift comes into the market, they have introduced a new variant – W9. The W9 variant is priced at ₹ 15.4 lakhs (ex-showroom, Delhi). It is positioned between the W8 and W10 variants. The W9 variants draws in a few features from the W10 variant. Thus, Mahindra is offering a more feature loaded variant at an affordable price point. The 2017 Mahindra XUV500 is a great option to consider with these updates. This makes it an exciting product to consider. SUVs and more SUVs are there around us these days. Be it the sub-4 meter SUVs or the bigger ones, all are getting a revamp or an upgrade. The Renault Duster was the first affordable of the modern monocoque SUVs and it changed the market completely. This time the french marquee has upped their game further and are ready to launch their new SUV – the Renault Captur. What is this SUV (pronounced ‘Capture’) all about? Should you buy it? Read further in our review. 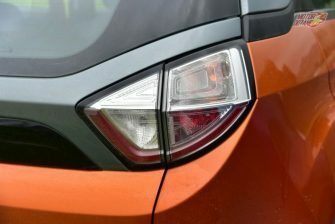 We drive the Renault Captur to find out how good it is.